Though denim trends are ever-changing, there's one style that has been consistent in our wardrobes for years: skinny jeans. The simple, fitted bottoms are a great go-to for all occasions, and they can be paired with just about everything in our closets, from a refined blazer to an asymmetric-hem dress. What's more, the silhouette is universally flattering and oh-so-comfortable, especially if said pair has ample stretch (a design element to always look for on your jean search). Now, if you're at a loss for how to style skinny jeans in a way that best suits your shape, don't fret. 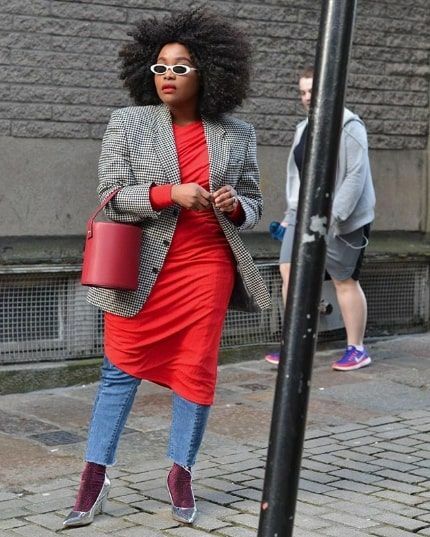 We've turned to some of our favorite fashion girls for examples of exactly how to style skinny jeans for every body type. Of course, you can and should wear skinnies as you please; the below tips are simply small styling advises you can follow if you're in a rut. Below, how to wear skinny jeans, for every body shape. Pick a pair of skinnies that have good stretch and slim-fitting cut. Style them with an oversized blazer or dress to balance out proportions. Pick an asymmetric dress to wear over your skinny jeans. Style an oversized blazer with skinny jeans to play with proportions. Style skinny jeans with dresses that cinch at the waist and have a flowy skirt. This will balance out your hips, especially when wearing skinny jeans. Pick a dress in a bright color. Layer a long button-down with a fitted sweater. Make sure to find a pair of skinny jeans that are suited for tall frames. As for the styling? Rock them with everything from a fitted crop top to a long, flowy tunic. Tie your blouse to show off the high-waisted cut. Style the skinny jeans with a belted blouse. This gives some added shape. Skinny jeans are a great pick for petite frames. They're fitting and make the legs look longer. Pick a pair with a high-waisted cut to further create the illusion of longer legs. Wear your sweater tucked in to show off the high-waisted cut. Style skinny jeans with a slightly oversized sweater for a relaxed look. Pair this dark-wash pair with a fitted white tee. A pick for tall girls. Velvet is so cozy for winter. Next up, shop the best skinny jeans on Nordstrom.